Leeds United have been plunged into a goalkeeper crisis ahead of their return to action against Bristol City at Elland Road on Saturday. Head coach Marcelo Bielsa has revealed that regular stopper Bailey Peacock-Farrell is set to miss the Sky Bet Championship game because of a knee injury picked up in training. And with back-up Jamal Blackburn already ruled out with a broken leg it leaves United without a goalkeeper with any first team experience. The injury news is even worse with Bielsa also saying centre-back Pontus Jansson was likely to miss the Bristol City match, leaving the Whites with just one recognised central defender as well. When asked about the fitness of Jansson, Bielsa said: “I think he won’t be available for this weekend. “Until yesterday we thought he would be available but now the game is getting closer I don’t have the same optimism. “He didn’t train with the group so it’s probable that he won’t play. “Phillips can play as a centre back or Aapo Halme is another possibility - this is two possibilities. On his goalkeeping situation, Bielsa added: “Also for Peacock-Farrell it will be difficult for him to play because yesterday at the end of the training session he had a problem with his knee and he probably won’t be able to play. 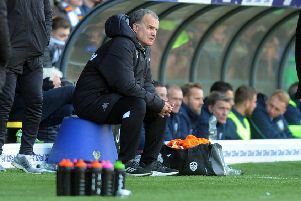 Leeds could ask the EFL for special dispensation to sign an emergency goalkeeper in the absence of both Peacock-Farrell and Blackman, but Bielsa was unsure about whether this was possible before Saturday’s game. In all, Leeds look set to be without seven first teamers with defenders Luke Ayling and Gaetano Berardi ruled out until the New Year, striker Patrick Bamford still on the sidelines and attacking midfielder Izzy Brown not ready yet after his injury.